One major reason why we’re brazenly optimistic about Marvel’s announced Captain America 3 is that the team behind this year’s successful Captain America: The Winter Soldier will stay in place to guide the path of our nation’s proudest warrior. Instead of starting cold, the team of Anthony and Joe Russo (directors) -- as well as screenwriters Christopher Markus and Stephen McFeely – can pick up where they left off with Steve Rogers, and continue to expand on his recently shaken up world. What plans do they have in mind? 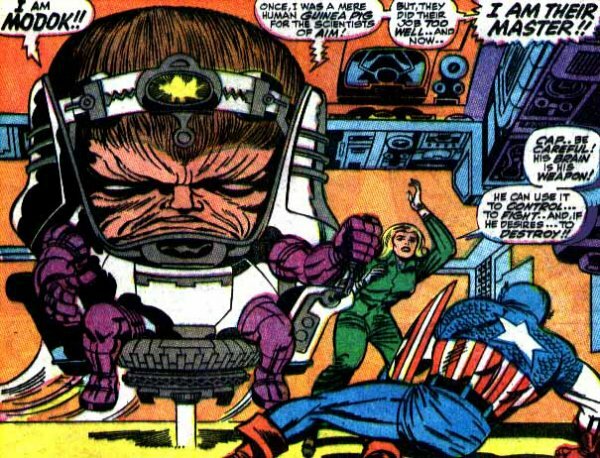 I want to put Modok into something, but you can’t just drop a giant floating head in! It’s not like, ‘Oh, we have to go talk to this guy – there’s something I should tell you about him first…’ [laughs]. Suddenly the whole movie needs to take on that structure in order to accommodate him. I never win that fight!" The duo did reveal, though, that early drafts of The Winter Soldier did make room for Jeremy Renner’s Hawkeye character, but in the end, "he didn’t have enough to do and suddenly it seemed like we were giving him short shrift. Hey, it’s a cameo!" A lot of his actions fell to the Black Widow (Scarlett Johansson). Maybe a different Avenger can end up teaming up with Cap in the third installment. I guess a lot of that will determine how the chips fall at the end of Joss Whedon’s The Avengers: Age of Ultron. He’s one man versus this giant organization – you’re not going to have him drive in with a tank, so there’s going to be some underhandedness. And suddenly it begins to suggest a political conspiracy." There’s no greater currency in the Marvel universe than a Kevin Feige script note. What will he suggest for Captain America 3? Stay tuned, and we’ll report everything that we hear.